My new release, Music of Her Heart, is set in 1869. 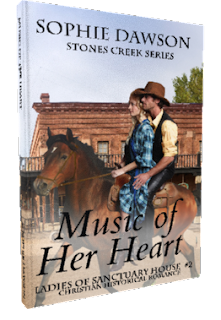 It’s book two in my Stones Creek - Ladies of Sanctuary House series. In writing one of the early scenes, I needed to be sure what sort of corseting the main character, Gema, would be wearing and whether she could easily take it off without help. I realize much has been written about corsets, a lot negative. Gema is a Russian immigrant, orphaned at sixteen and taken to live at Sanctuary Place. It’s a woman’s mission set just outside of Dubuque, Iowa, fictional of course, that offers shelter, education, safety, and the Gospel to girls and women who are in need from circumstances beyond their control, or from poor life choices. With the opening of the West, and the dearth of women, Sanctuary House is built in Stones Creek, Colorado for the women, Ladies as I call them, and their children to move to and begin new lives, possibly become brides to men in the area. So far, two books have been released concerning these ladies: Chloe’s Sanctuary and Laundry Ladies Love. Okay, back to Gema and her underpinnings, now that I’ve given you some background. When we think of corsets, we naturally think of the Victorian corsets of the late 1800’s. Post Civil War from about 1870 onward. Actually, we probably think of Madonna’s and Lady Gaga’s corsets worn when they perform. Not what ladies would wear back then, and certainly they would not show. Soiled doves the exception. Stays and corsets were the foundation garments for centuries before the invention of the bra, girdle, and Spanx, not to mention control top pantyhose. They held up the bosom and created the shape of the torso popular at the time. If you have anything up top, you probably understand why women throughout the ages wore something to keep the girls contained. I’m not going into a detailed history of stays and corsets, or the pros and cons. I was more interested in what Gema, a poor woman, would have worn and whether it had a split busk or not. A busk is a stiff rod down the center front that keeps the garment from sagging. Think of it as the underwire of the day. Until the 1830’s they were made of one piece. This only allowed the stays to be put on by lacing and removed by unlacing down the back. When the split busk was invented, it allowed a woman to much more easily dress by herself. The innovation took over and by the 1850’s nearly all corsets and stays were made with split busks. The historic stays and corsets we see in photos and museums were most likely those of wealthy, elite women. My Ladies of Sanctuary House are anything but that. They were poor women hoping to improve their lot in life by moving and possibly marrying men in the West. They probably wouldn’t have had whale-boned corsets made of silk. Theirs, which they may have sewn themselves, would have been cotton or linen, quilted with cording or tightly rolled paper rather than bones simply because of the cost. They would have worn them until they fell apart. Women protected their corsets by wearing a chemise under and corset over over them. Those were easily washed. Corsets were not. Corsets with steel bones couldn't be washed since the rods would rust. 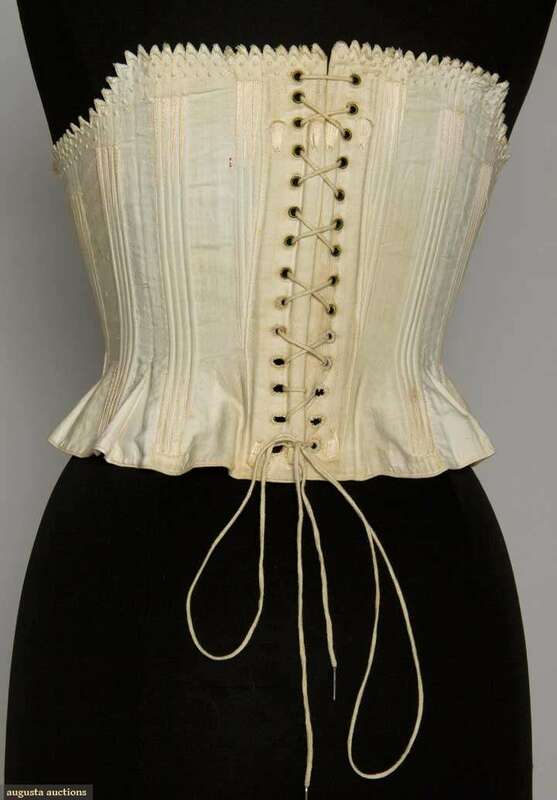 Here's a corded corset from 1855-1865. It would have had cotton cords quilted in for the stays, or possibly rolled paper. Notice the lacing pulling the sides together. This was not the way a corset would be worn. At least 2-4 inches gap should remain between the edges. The waist size of a corset is the measure that is of the garment without the gap. This one measures 25 inches, the person would have an actual waist measurement of at least 27-30 inches. 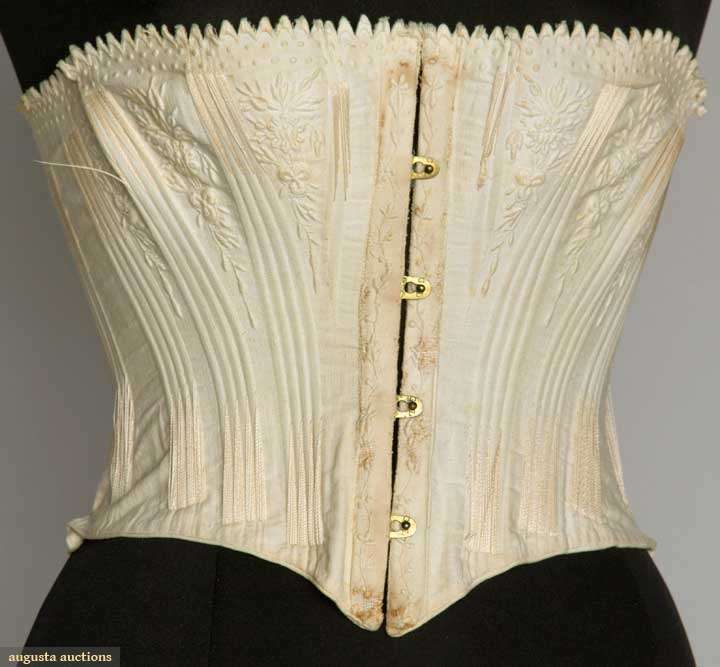 The corset ends just below the waist and would have allowed for ease of movement as a woman went about her daily duties. This is the sort of garment Gema, a hotel maid, might have been wearing, although hers would not have had the lovely trapunto quilted floral sprays between the ribs. So my problem was solved. Gema could get out of her corset, by herself, and flop it over the back of the chair like I wanted her to.